Have you heard that online business is too complicated and expensive for an average person? This is a pack of lies. Even more, there are a lot of arguments that show you can launch an online store within the budget of a dinner out and no undue efforts. What’s the secret? Open source solutions! Open source software for online commerce plays the main role in global e-Business. Just take a look at the list of the most used e-Commerce platforms according to BuiltWith - the majority of them are open source. Therefore, shopping carts with free access to the source code rule the chart, and it happens for a reason. Open Source solutions are free-to-download, install and customize. Every merchant can go to the official website and download a set of files at no cost that will bring revenue in the future. Moreover, store owners have an opportunity to change the core in accordance with their business needs. This type of software is powerful to meet requirements of the most strict businesses of all sizes. Usually, the only limit for these shopping carts appears to be virtual storage and hosting capacities. Unlimited bandwidth, products, categories and other entities are default features for all open source platforms. Every more or less popular open source solution has lots of custom extensions, design templates accompanied with extensive documentation and forums highlighting the most relevant information. Having access to the code, users and developers work together to enhance the feel and functionality of platforms. Store owners are also free to choose hosting providers that will meet their business requirements best. Whether you need a starter 4$/month plan or a dedicated server - there’s no problems with that. Required additional security? There’s plenty of to pick from. Prefer geographically close hostings? Go for it - there’s most certainly some hosting providers nearby! Looking for a free one? Good luck with that! Just take your time to find out how hosting discounts work. Why Free and Open Source Can be Expensive? This question confuses. But, let’s take a look at the technical side of this type of software. If you are not skilled programmer, there will be a need of assistance to set up a store. The website also needs to look attractive and have a high performance speed. Thus, the service of a freelancer or another tech savvy person will definitely cost you some money. Of course, there are pre-built templates and third-party extensions that may save you time and money for development. But if you wish to impress customers with an eye-catching and striking look, you’ll have to purchase premium themes or modules. 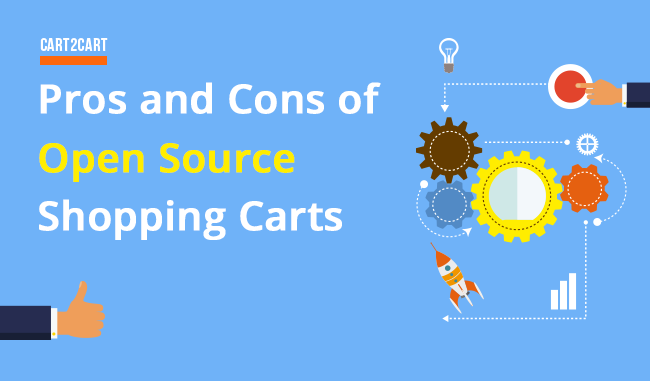 In addition, open source shopping carts usually have no official support. All the questions are discussed on the community forums and other resources where shopping cart users share their experience. So, if you are not a programmer, you will need to hire a developer in case of any issues regarding your online store. All these demonstrate clearly why open source solution can cost you more funds than you’ve expected at the very beginning. Be sure though - it will pay off. If you feel inspired to switch to an open source solution, Cart2Cart offers a chance to perform it on the double. Start with a free Demo Migration and check out how your products will look like on a desirable open source shopping cart in no time.